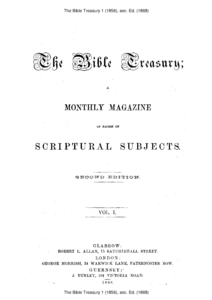 The Bible Treasury was edited by W. Kelly and since 1906 by F. E. Race. 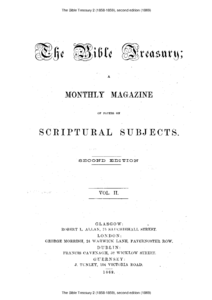 "The Bible Treasury" was often reprinted and is still available in print from Chapter Two or Christliche Schriftenverbreitung or Believers Bookshelf or Present Truth Publishers and others. An online edition is available from STEM-publishing and from Bible Truth Publishers. 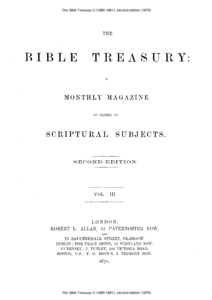 I have put here only the pdf-files of the first three volumes of the second editon of "The Bible Treasury". These are not 100% identical with the original volumes. The editor himself wrote: "In the first edition, some papers appeared which it seems due to truth to replace, and notices of ephemeral matter are consigned to oblivion." But he added a few other articles which are not in the first edition and are also lacking in the reprints (which were made from the first edition). The files of the second edition are also on the website of STEM-publishing . See also: The Bible Treasury.